Carry one in your purse. You never know when you may need something to hold small stuff like a pair of earrings or a button. Use it to carry pills that you take as needed. It's the perfect size to hold allergy pills like Benadryl or Claritin. Is your favorite lipstick almost all used up? Scoop out what is left and put it in a contact lens case and apply it with a brush. You will be able to get several more uses from it and not a bit of it will be wasted! Got some broken blush or eyeshadow? Crush it up and store it in a contact case. Put a little of your favorite lotion and carry it with you — you never know when you might need a little bit of lotion. Makes a great travel container for your favorite face cream. Put some mouthwash in each side and screw the lids on super tight and carry in your purse or car. Use in a pinch for bad breath. This will particularly come in handy before a job interview! Perfect for storing DIY lip gloss and other homemade cosmetics and beauty products. The first thing I did to my case was paint it silver with spray paint. This is completely optional but since my case was two different colors (and I think most of them are), I wanted to make it all one color before starting with the rhinestones. 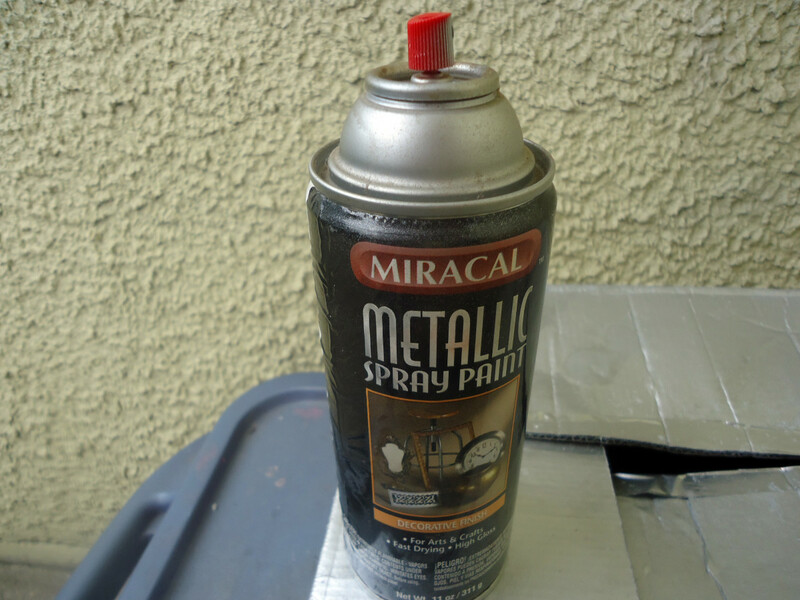 Also, I painted the outside only with the spray paint. I don't recommend spraying the inside, especially if you will be using it to store any cosmetics or contact lenses. I put tape over both "bowls" to stop any paint from adhering to the inside of the case. One more thing about the paint. It's got to be a type of paint that will adhere to plastic. Spray paint does the job enough for me. If you don't want to paint your case, feel free to skip this and go to step 2. Time to bring out the bling! 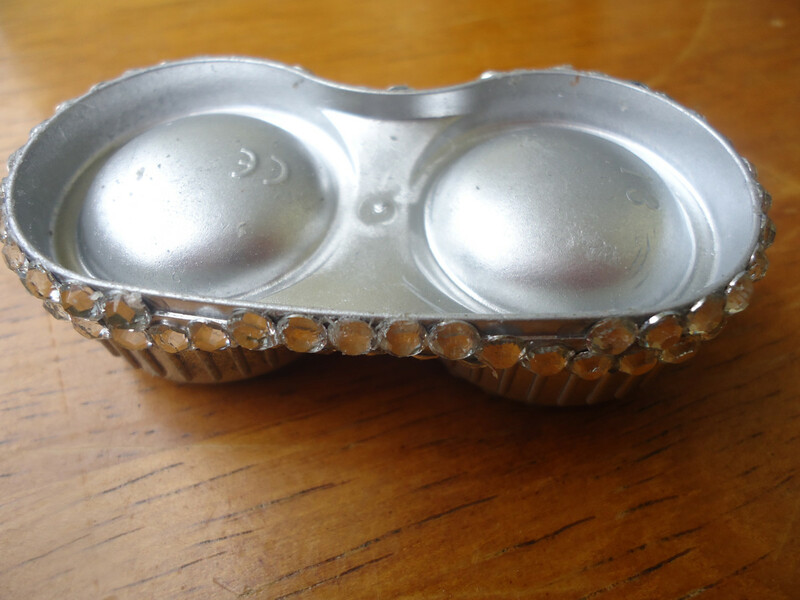 First take both lids off the case and you will have three pieces. I started off doing the tops of the two round caps. I did it row by row starting from the outer edge of the circle until I hit the center. 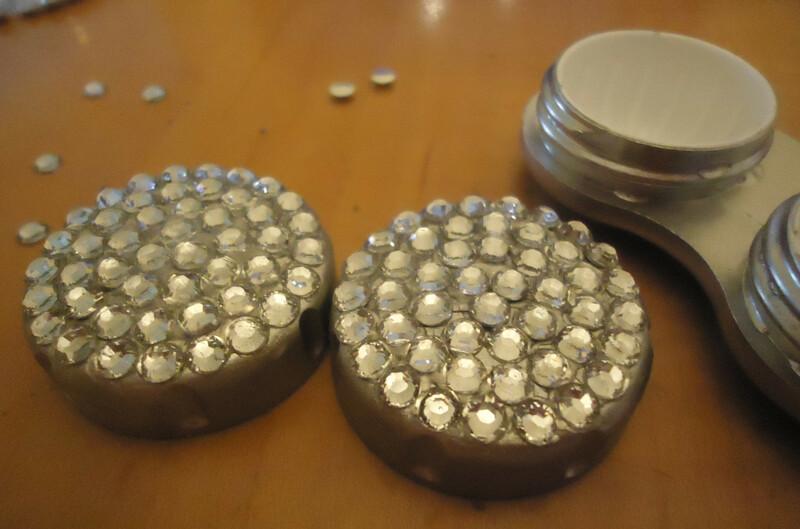 I wanted to do the sides, where you grip to twist the cap on, but the lids are too close together when screwed on so I wasn't able to cover around the sides of the lids with bling. Then I did the bottom piece. I basically just did one row around the bottom piece of the case. It didn't take that long as there wasn't much surface to cover. Then I placed a few rhinestones where I could on the top part of the bottom case. Also, be careful about the placement of the rhinestones on the top part of the bottom piece. 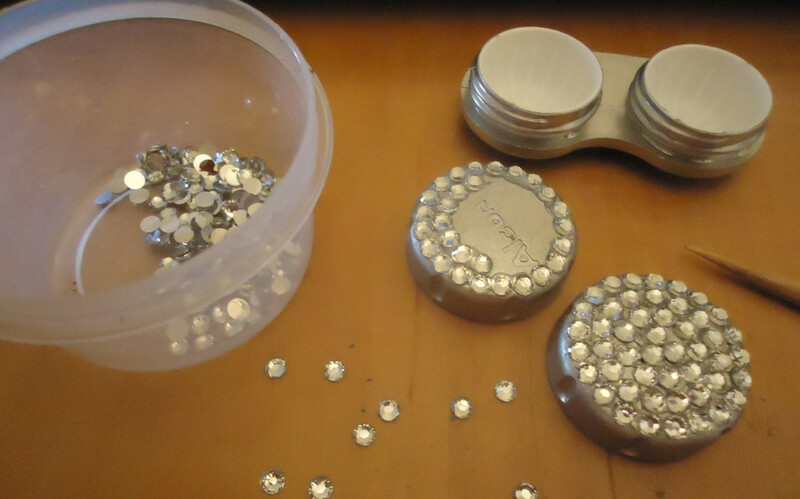 Make sure you aren't putting rhinestones anywhere that will stop the lids from screwing on completely. Once you have all the rhinestones glued on, that is pretty much it. 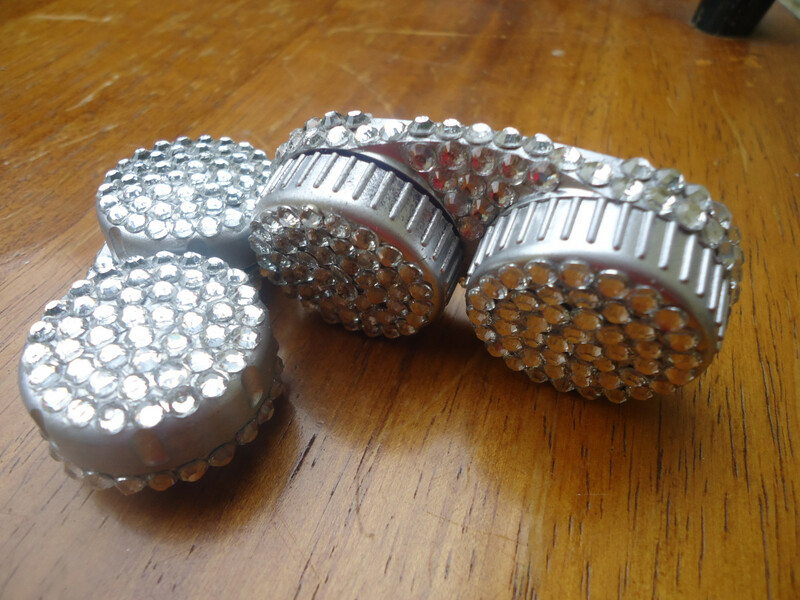 Let it sit a while to make sure all the glue is dry and then you are ready to start using your awesome blinged out contact lens case! I want to say thank you to SuzieHQ for the idea and inspiration for this article! She writes a lot of DIY beauty articles and she had written one particular and awesome article about DIY layered lip gloss and mentioned using a contact lens case to store it in and I thought that was very clever. 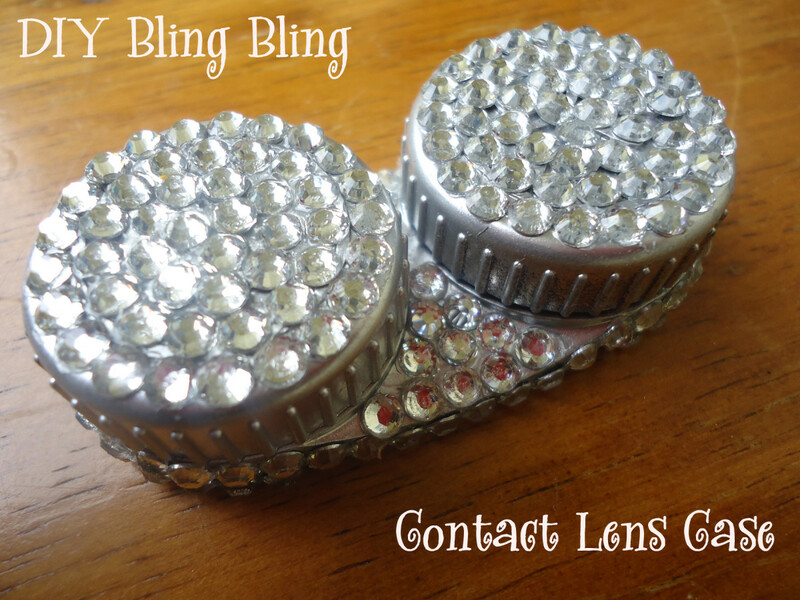 She actually mentioned something about a blinged-out contact case and so here it is! K Kiss- Thank you so much... it was lots of fun to do, for sure and really turned out pretty.. and I know yours will too! This is such a cool thing to do. I have been wearing contact lenses for so long (for fashion purposed :P) and never thought of giving my container a makeover. Thanks now I know what I will be doing this weekend. Very cute I should make one for my granddaughter. Thanks for sharing. Voted up. Kathryn Stratford- Thank you so much! Lucky YOU, I've always wanted to work at a craft store.... it would be like a dream job :) Have fun making your blinged out contact case! Thelma Alberts- You are welcome....Yes, definitely tell your son to hang on to those contact cases for you. This was so much fun to make. Thank you for dropping by!! Oh, this is so pretty! I just started working at a craft store, so I may pick up the supplies to decorate my contact lens. Great job! WOW! I love this. I think I will be asking my son not to throw his contact lenses case for me to use. Voted up and awesome! Thanks for sharing. Oh, la, la! What a chic way to express yourself! Love thie idea and it's going to be a big hit with many women out there. If I wore contacts, I would be making this one. Wait, maybe I will -- as gifts at Christmas! Thanks for the idea. I don't know if I could do this, but I found this tutorial very interesting. These are so stinkin cute! Nice work! I was almost thinking you should spray a coat of clear paint over it to lock them on. Nice hub! Even though I don't wear contacts, I had to take a look at this and will be pinning. I'm into bling right now, although, why I don't know. I'm not a blingy girl. This is super cute and would make great little gifts for friends who do wear contacts. Thanks! 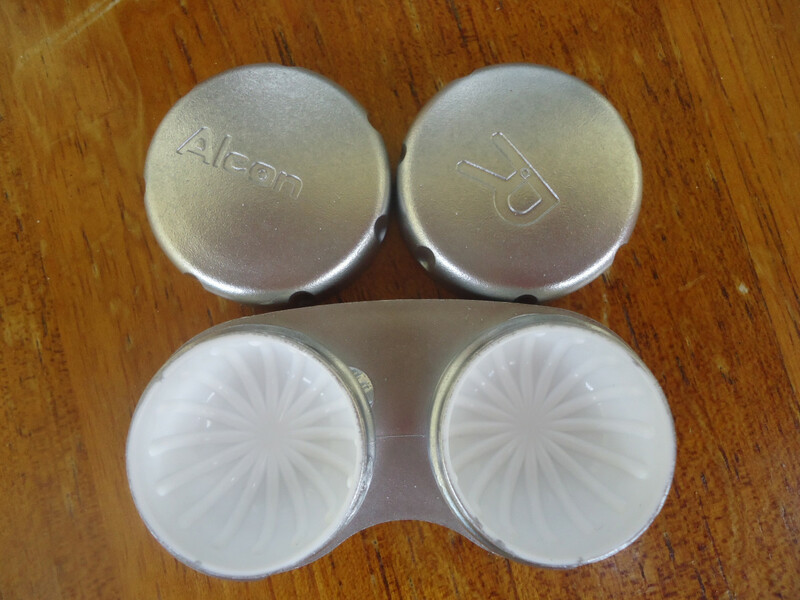 btrbell- So glad you liked this idea...Have fun blinging your contact case!! I get my rhinestones super cheap on Ebay. 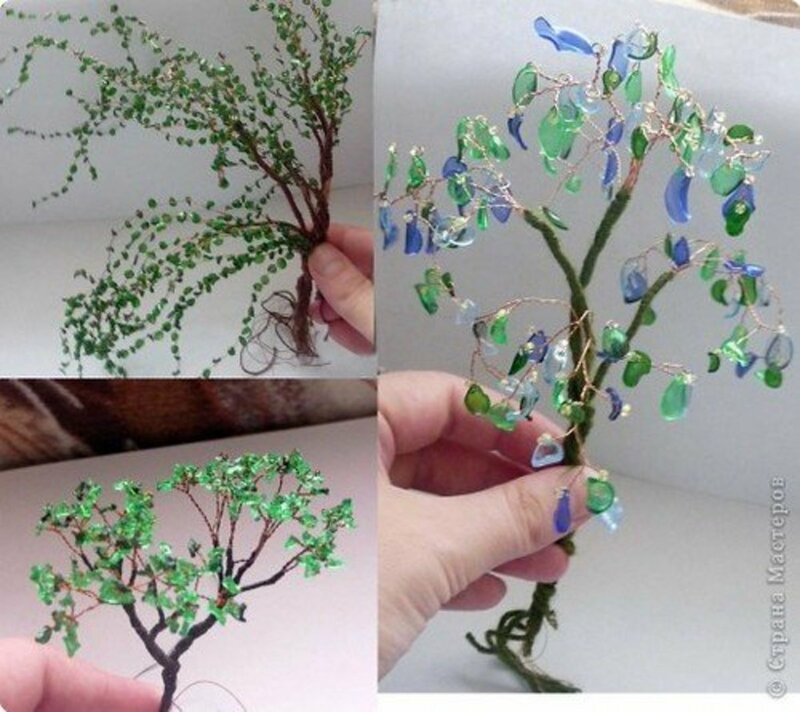 They are plastic but they are super sparkly and look just like the glass ones. Well, Jamie, I brought home an empty c/l case today. Now I just need to buy the bling! Yay! thank you! and I'll let SuzieQ know, too! Great idea! I have two of those same generic white and green lens cases. And they are soooo ugly and plain! Love the idea of personalizing them! This would also be great for people who use novelty lenses, they could tell from the case which set was inside! Awesome as usual! Voting up! WOW . . .You did an AWESOME job, so glad I mentioned it to you, no better woman for the job!! I want one now!! Lovin it and will be linking in to my lippy hubs and also my new one When should you throw your makeup out. Thanks sooooo much for the lovely mention, the fact you made it up is truly special and amazing to see it come to life. This is getting all the votes, shares and pins possible - Many thanks and fantastic job!! A real money spinner if you sold them!!! kashmir56- Thank you for the votes up and for your continued support. I hope you are having an awesome day! kidscrafts- Thank you! I just love gluing rhinestones on things.. I'll cover just about anything with them. Thank you so much for dropping by! btrbell- Thank you :) I love learning new ways to use common everyday things... SuzieHQ is my inspiration for this hub.. she wrote a hub about diy layered lip gloss and had suggested an empty contact case to store it in and she is the one who actually came up with the idea to bling one up... I had about 5 empty cases laying around so thought it was a great idea. I'll put rhinestones on anything, LOL! Thank you so much for dropping by and for the votes up! 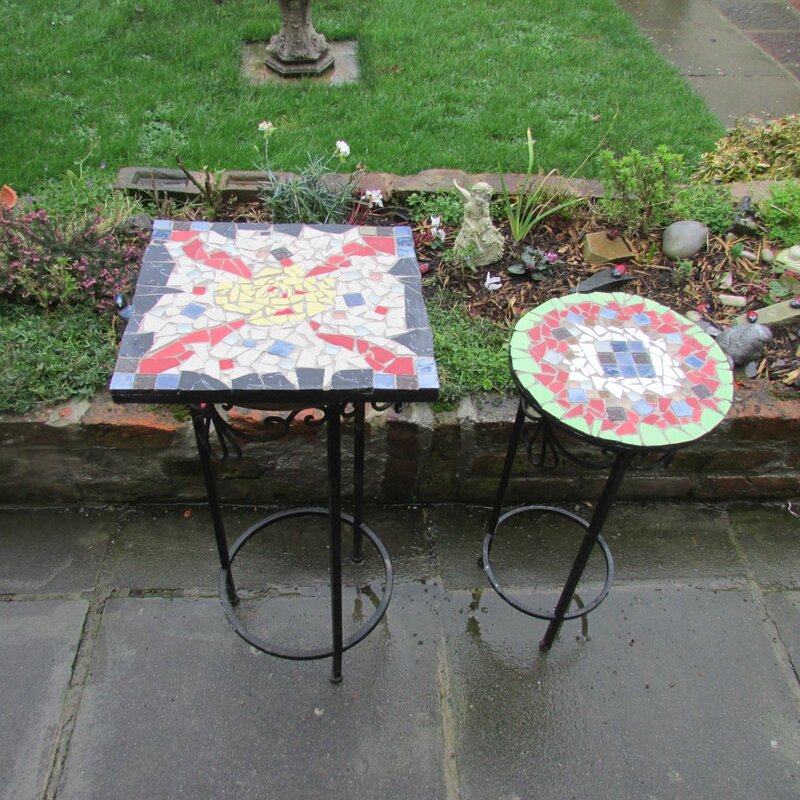 Jackie Lynnley- You are welcome.. glad you enjoyed it! I have already tossed it into my purse in case I need to store small parts sometime. Thank you for stopping by! 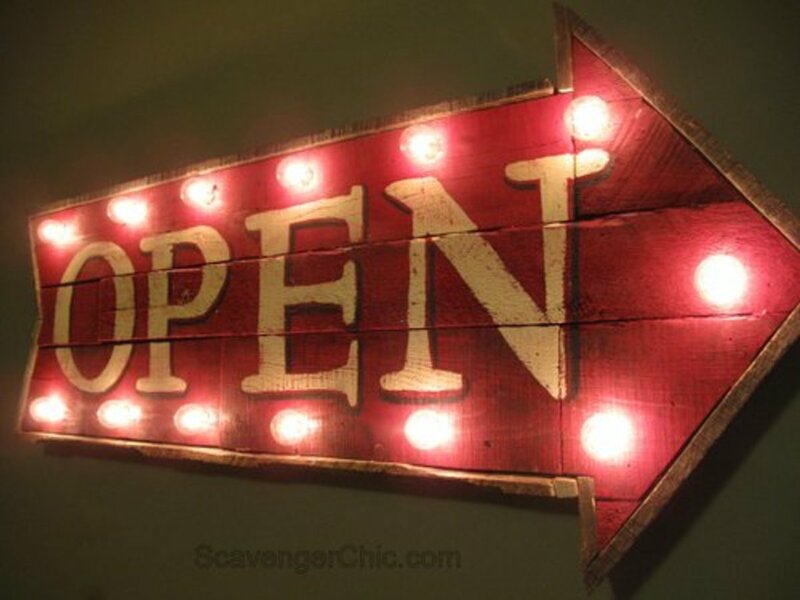 Hi my friend, great ideas within this well written and explained hub ! Good idea! It shows that you just need creativity to transform something simple in something great with a lot of class! Very cute. I love creative ideas for sometimes ordinary things. Great job as always...Love your creativity...Voting UP and pinning.